The big news story is Red Stag's announcement to build a new $60m sawmill on its Waipa site in Rotorua. The mill is planned to run two shifts and take in 1.2m tonnes of logs per year. The re-election of a National-led government has been favourably received by financial markets and the housing market. Major falls in the international milk price, however, has led to Fonterra forecasting a slim $5.30/kg payout, leading to major falls in the value of the NZ$. This fall gained momentum from strong economic figures coming out of the USA and the Governor of the Reserve Bank of New Zealand strongly stating that the Kiwi dollar was overvalued. So whilst the much lower milk payouts will weigh heavily on dairy farmers and the economy generally, the lower Kiwi dollar will boost exporter revenues more generally and be a welcome relief to forest products exporters in particular. Its worth noting that the BNZ is forecasting the NZ$:US$ cross rate to be 0.73 at the end of next year. Last month we reported a tentative drop in log inventories in China based on early September figures. This trend continued strongly during September, and by the end of the first three weeks of September (these are the most recent figures received), stocks had dropped to 3.8m m³. This represents a drop in stocks of 21,000 m³ per day for this period. During the period delivery (new shipment arrivals) of North American logs was only 38% of off-take (sales to Chinese processors); New Zealand deliveries were 81% of off-take. This reflects continued robust demand for logs in China with total off-take at around 60,000 m³ per day, and much lower deliveries (at around 39,000 m³ per day). Red Stag Timber Ltd recently announced a significant investment in additional log processing at its Waipa site just out of Rotorua. A new world-scale, state-of-the-art mill is planned to process around 1.2m tonnes of logs per annum on two shifts and cost around $60m. The new mill will have the latest scanning, optimisation and sawing equipment and is expected to be up and running mid 2016. The investment will lift the company's annual output from 450,000 m³ currently to 700,000 m³ in five years' time. This investment reinforces Red Stag's commitment to be a leader in best-practice and efficient wood processing in New Zealand. 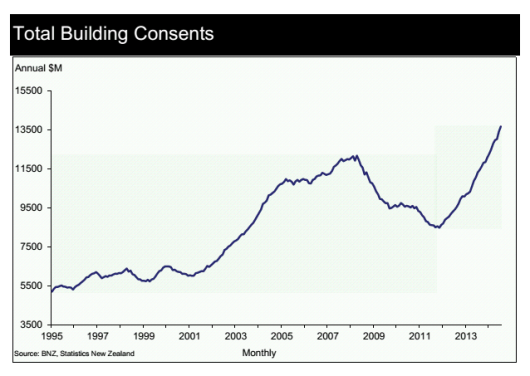 Strong building activity centred on Auckland and Christchurch underpins strong domestic demand for wood products. This demand will be bolstered further by the recent Government deal with the Auckland Council to fast-track new land for building, including low-cost houses through Special Housing Areas. On top of the favourable exchange rate, the domestic pruned log price is also benefiting from an increased order profile for export clear lumber to the US. This is due to improvements in US housing and renovation activity with sales of newly built houses at the highest level since May 2008. The PF Olsen log price index increased again this month. It rose 5 points from 98 in September to 103 in October. 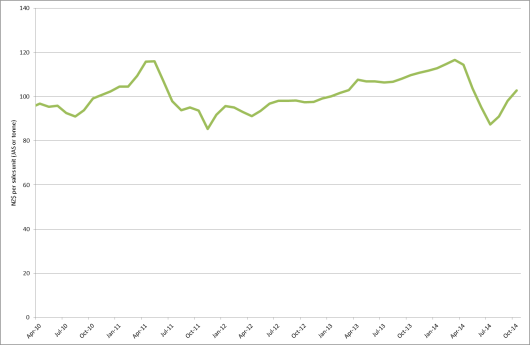 It is now 14 points below the March 2014 peak of 117. Basis of Index: This Index is based on prices in the table below weighted in proportions that represent a broad average of log grades produced from a typical pruned forest with a mix of domestic/export log supply. Peter Weblin, Marketing Manager at PF Olsen, is on a visit in China at present and has filed the following observations and photos for Wood Matters this month. At the time this report was filed, we have focused on visits and meetings with log traders, wood processors and ports along the eastern seaboard of China from Shanghai to Qingdao. This area receives the bulk of New Zealand's Radiata pine log exports. The rapid pace of growth of the main urban areas is clearly evident in the form of the plethora of high rise apartments being constructed. We were told that in the big growth cities such as Shenzhen, Shanghai, Qingdao and Beijing apartments couldn't be built fast enough to keep up with demand. When asked about the "ghost cities" we were told that these existed more inland in newly developing cities where the maxim "we will build and the people will come" has not eventuated yet. Despite the obvious strong construction activity, however, there is general nervousness about the real estate market and the extent of the domino effect from excessive leverage of developers and company cross-guarantees. Adding to the concern is reported zero growth in domestic Chinese steel consumption year to date, something you wouldn't have expected if GDP was growing 7-7.5% as claimed. On the positive side, log stocks have dropped considerably at key ports. The overall sentiment is that log prices are likely to stay at current levels for the foreseeable future, buffeted by the high volatility in currency movements at present. Construction cranes continue to crowd the skyline in the fast growing cities along the eastern seaboard. 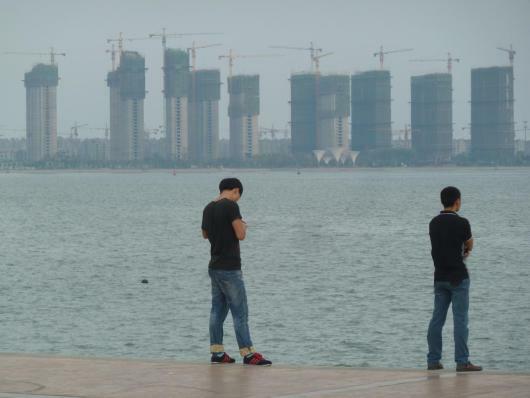 This is looking across the bay at Qingdao. It was somewhat sobering when we were told that the average apartment block only consumed 300 to 400 m³ of lumber and plywood (mainly as concrete formwork). China is currently consuming about 65,000 m³ of logs per day from New Zealand and other sources imported through around 25 seaports. We were told that over 90% of these logs are going into construction. Whilst we don't know the split of wood going into housing versus infrastructure (we observed a relatively small amount of wood use in infrastructure projects we passed), if we guess that housing takes 80%, then we can derive a construction rate of over 120 high-rise apartments per day. And that doesn't account for domestic log supply (which we were told was over 100,000 m³ per day into multiple end-uses) and significant imports of sawn lumber. This construction level sounds believable considering the continued strong momentum of urbanisation in China. We visited a plywood factory near Shanghai. Notable were the high conversion rates (around 78%) and the peeling down to broom stick-sized cores. This is achieved by initially peeling on a traditional lathe with the log bolt between two chucks. The bolt is then moved to a second peeler where it is driven by rollers. KI grade was the most common log processed in this mill. The veneers are air-dried in a large yard. This means a lot of stock on hand and sometimes means the mill has to close during prolonged wet periods, but it does save on drying costs. Whilst Kiwis would consider this situation a case of poor separation of work and home life, for many Chinese mill workers it avoids commuting on congested roads and rent from the mill owner is low and sometimes free. At wage rates of about NZ$ 900 per month (equivalent) workers can save or send money home to support rural family members. Every fibre of wood is utilised. 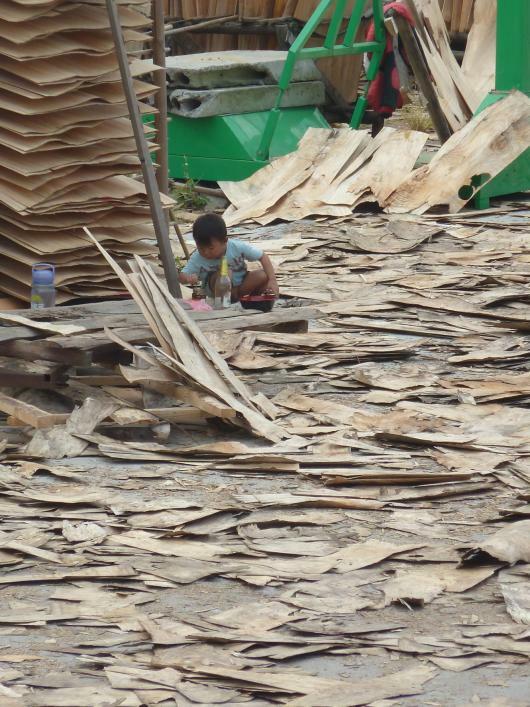 In the photo below, a worker's child plays amidst the rejected veneer sheets that are being dried on the asphalt yard. When dried this fibre will go in the boiler which is used to heat the plywood presses. A worker's child plays amidst the drying rejected veneer sheets. This enables parents to do some work at the mill and avoid day care costs for their child. 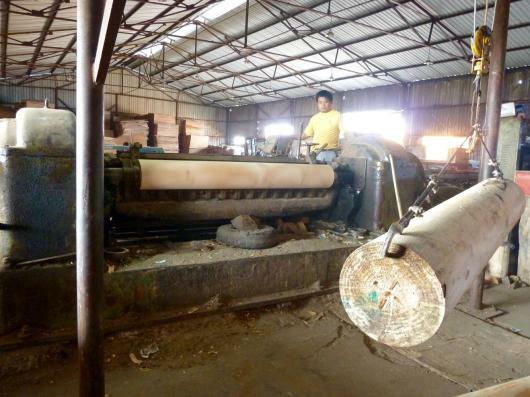 We observed many women workers at all the mills we visited (we were told the plywood plant had 40% women). The average age looked high, apparently reflecting disinterest in this type of work by young people. This immediately struck a chord with a similar issue in forestry in New Zealand. Radiata pine logs supplied by PF Olsen are being peeled for plywood in a factory just north of Shanghai. The final ply-sheet products looked like high quality. Further north we took the opportunity to catch up with LiChen at Lanshan. LiChen is a leading innovator of value-added processing of New Zealand Radiata pine. 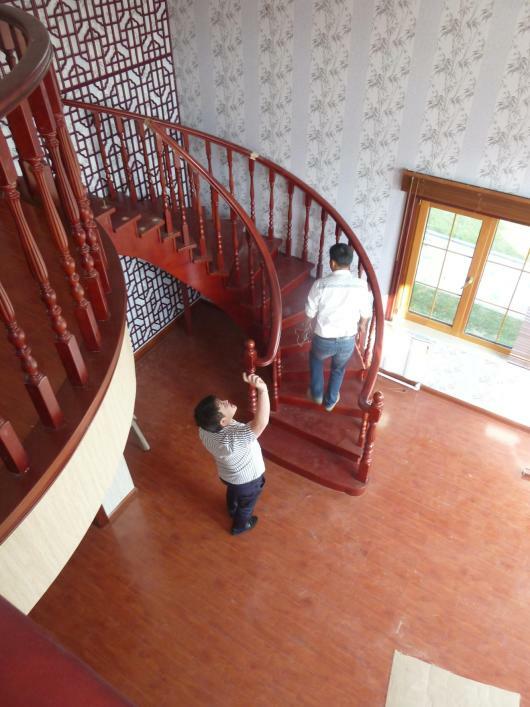 Concept houses being constructed in March last year, when we were last in China, are now finished. The house pictured is almost entirely constructed from New Zealand Radiata pine, including most of the interior fit-out. This is very radical in China. 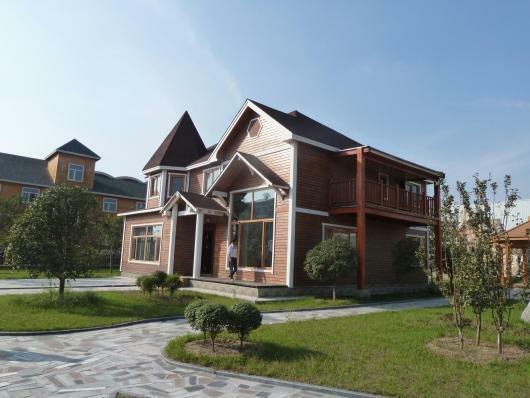 LiChen's completed Radiata pine house at his Lanshan factory. The main market for these houses is considered to be high wealth people wanting a holiday house. PF Olsen is facilitating technology transfer of improved treatment options for the timber in weather exposed uses. Whilst this house is constructed from pine framing, LiChen is also building "Lockwood-style" interlocking houses. It was impressive to see New Zealand Radiata pine being used for high-value applications such as balustrades and staircases in the LiChen Radiata pine concept house. Other Radiata pine wood processing visited at LiChen included: finger jointing, kiln drying, finger jointed edge-glued clearwood panels, finger jointed mouldings, painted mouldings, doors and glulam beams. It's great to see such a commitment to adding value to Radiata pine sourced from New Zealand. 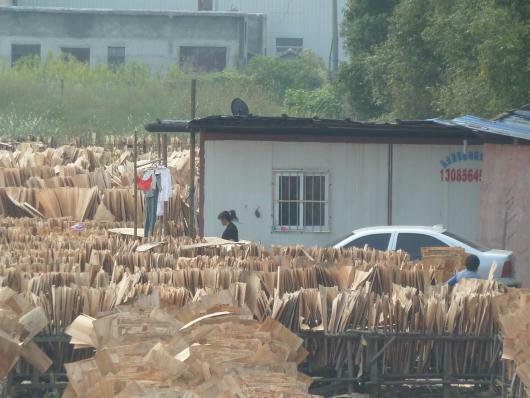 Whilst this only represents a small proportion of wood end-use in China, it is an important step up the value chain. A step made even more important considering what Radiata pine could be used for once China concludes its massive urbanisation programme in 20-30 years and the massive demand for timber for dwelling construction subsides.